What is your latest pen acquisition? Thread: What is your latest pen acquisition? Re: What is your latest pen acquisition? As a sharp wit and powerful sarcasm is a sign that you already have. 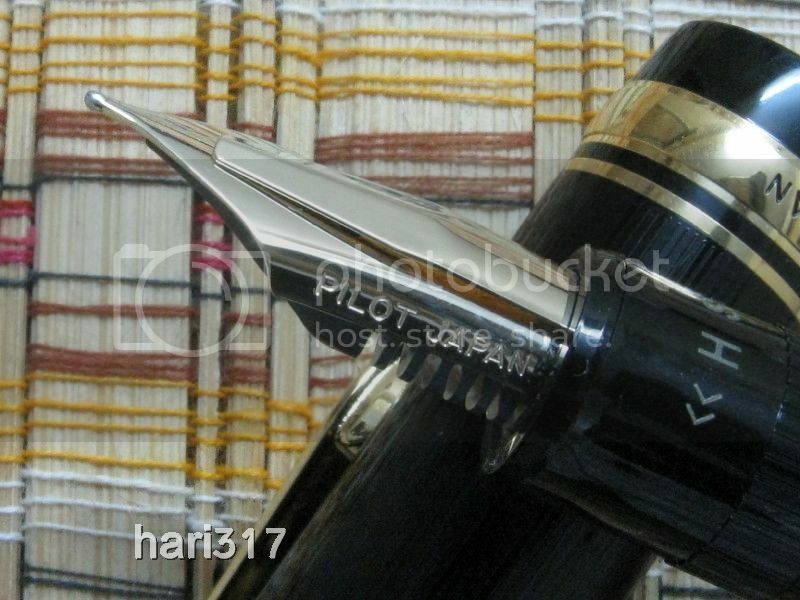 Just got myself a Mabbie Todd Blackbird eyedropper. So far it has been a little bit fiddly, but it is looking to be a great pen. Hello, my name is Nathan. Pleased to make your aquaintance. Loving trying out my new/old pens, a Wahl Eversharp, an Esterbrook 9128, an Eversharp Skyline, and the current winner, a Sheaffer New Balance...some of them are older than I am and still flexible, no wonder I like them! 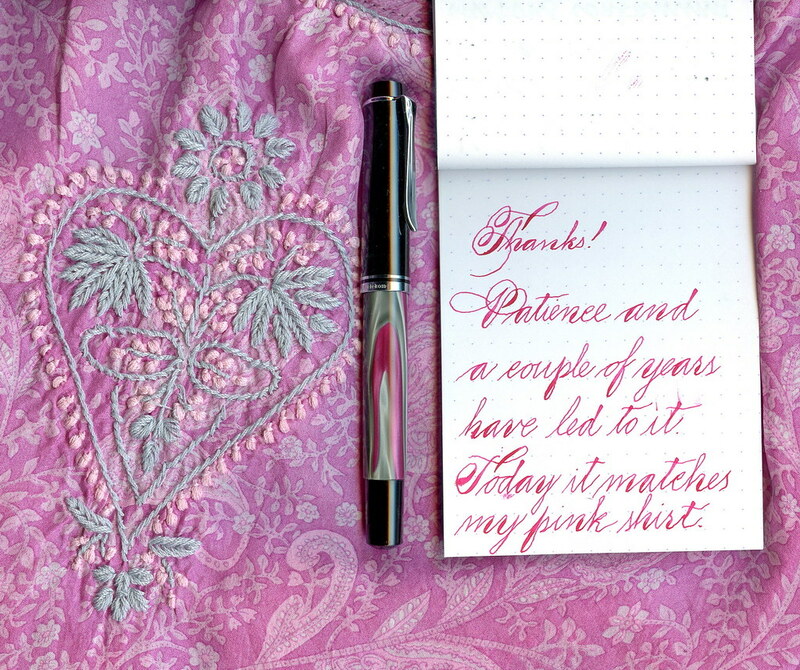 What a great idea, a pen a day to match your outfit! I wonder if my husband will buy it? I've never seen that Pelikan before. That's very nice. Cathy, your drawings are great. Enjoy the pens. And to everyone else, nice hauls. I'm doubly feeling the love for the Bexley Corona that flew in the door two days ago. Plistumi, that is one nice looking Pelikan! I did not know pelikans came in pink. I did not need to know this. My wallet is in danger. I got a nice Parker 51 today at the flea market. G'ah! Your flea market is way better than mine. My latest was the 2011 Lamy Safari Aquamarine in extra fine. Had been hunting for one for awhile as it is my son's birth year! Hopefully when he grows up he'll be into pens and I can pass it down to him. *hugs and pats back gently* You ought to visit some of our flea markets here some day soon, I bet that you could find some good stuff. The 51 set is very lightly used, but there are a couple of tiny dings in the cap. It writes really great. I filled it up several days ago and have been using it regularly. Although the Nassau set is great, the Estie set was the real coup. The green cracked ice pen is very rare, and the pencil is virtually impossible to find. It is also about the flashiest celluloid ever used on a pen. A few of the 2nd(?) generation Dorics would give it a run for its money. Lovely pens, all the same. Congratulations! "What are moon-letters?" asked the hobbit full of excitement. He loved maps, as I have told you before; and he also loved runes and letters, and cunning handwriting, though when he wrote himself it was a bit thin and spidery. Seriously? To my eye, the LeBoeuf is rather dull. Certainly I wouldn't call it "flashy". If you want flashy, look at a Platinum Koi. Of course, the main thing about the Estie Green Cracked Ice is the rarity. Try to find one of those at your local flea market. That may be just a matter of time, money and patience. I did get my MB 234½ at a flea market, you know. Maybe so, but from what I have seen your flea markets are very high caliber compared to most others! But you know, they are where you find them. Oh trust me, you have to look through a lot of useless things to find the good stuff here as well, but once in a while you hit that golden streak of luck where you find a seller with a few pens for sale. And the more sellers that get to know you as a pen and pen paraphernalia collector, the more the sellers will get back to you with their findings. And since there aren't that many danes of greenlandic origin sporting a 8-10 cm tall mohawk, people do tend to remember me. latest pen Noodler's Ink Company Konrad Ebonite Sahara Olive/black ripple. I don't think the mohawk thing is an option for me. I can thank male pattern baldness for that. In any case I just don't find much of anything interesting in local flea markets. Wish I could! Nice set for my drawing stuff...now I just need to find a way to clean out the old gunk inside the pen. Any any advice, guys? Pretty please? Found some dip pen nibs. The really funny thing is that the seller happens to be one of my neighbours here, so now I know where to get hold of him if I want to buy more nibs. He had three large moving-size cardboard crates full of original boxes with nibs and pencil refills, so I'll get in touch with him now and again and do a bit of shopping, I think. A couple of felt pens, I love the size. Unknown fp. Unfortunately I don't read arabic, I wish I knew what the text on the nib says. Parker thing w. cracked barrel. A tiny drop of glue and it should do alright as a work pen. Last edited by BikerBabe; May 10th, 2013 at 06:54 PM.